The writer of “Silver Screen Reflections” remembers actress Debbie Reynolds, who died on Wed., Dec. 28 at the age of 84. The actress died one day after the death of her daughter, Carrie Fisher. According to Variety, she was born Marie Frances Reynolds in El Paso, Texas in 1932. When she was eight years old, her family moved to Burbank, California. After winning the Miss Burbank contest in 1948, she was spotted by a talent agent from Warner Bros. Pictures. Studio head Jack Warner changed her name to Debbie Reynolds. After her Warner contract lapsed, she signed with Metro-Goldwyn-Mayer. One of her earliest well-known roles was in the 1950 musical “Two Weeks with Love,” alongside Ricardo Montalban, Jane Powell and Carleton Carpenter. One of the most memorable songs out of that film was “Aba Daba Honeymoon,” which was sung by Reynolds and Carpenter. Reynolds would go onto greater fame by being cast as the romantic lead in the 1952 MGM musical “Singin’ in the Rain,” alongside Gene Kelly and Donald O’Connor (Kelly co-directed the film with Stanley Donen). One of many memorable dance numbers in the film was the “Good Morning” number. “Singin’ in the Rain” was a smash success and propelled her into stardom. 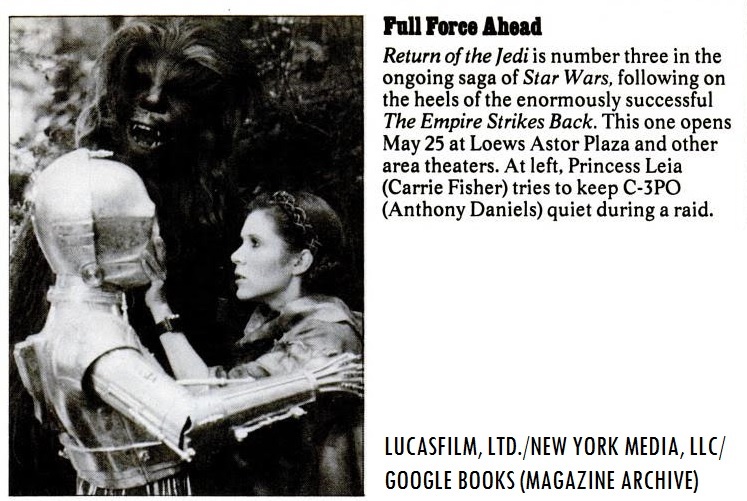 From a 1983 issue of New York Magazine. All rights acknowledged. The writer of “Silver Screen Reflections” remembers actress Carrie Fisher, who died on the morning of Dec. 27 at the age of 60. According to Deadline.com (an offshoot of Variety Magazine), Fisher suffered a massive heart attack on Fri., Dec. 23 during her flight from London to Los Angeles. Born on Oct. 21, 1956 to actress Debbie Reynolds and singer Eddie Fisher, her parents’ marriage did not last long due to her father’s scandalous affair with actress Elizabeth Taylor. According to Jenna Girard’s online retrospective on Carrie Fisher for Turner Classic Movies, Carrie Fisher decided to follow her mother’s footsteps by going into the entertainment business. In 1975, Fisher made her silver screen debut by appearing in Hal Ashby’s comedy “Shampoo,” featuring Warren Beatty, Goldie Hawn and Julie Christie. Two years later, Fisher would act in a role that would transform her into an international icon. The rest is motion picture history. Beginning in 1977 with George Lucas’ “Star Wars” (Episode IV: A New Hope), Fisher would play the role of Princess Leia, alongside Harrison Ford (as Han Solo) and Mark Hamill (as Luke Skywalker). Lucas’ film was a smash success and launched a cultural phenomenon. She would reprise her role of Leia in “The Empire Strikes Back” (Episode V, 1980) and “Return of the Jedi” (Episode VI, 1983). 32 years later, Fisher would reprise her role of Leia, this time as a General in “The Force Awakens” (Episode VII, 2015), directed by J.J. Abrams. In addition to her involvement with the original “Star Wars” film trilogy, she also made appearances in various films, including “The Blues Brothers” (1980, opposite Dan Aykroyd and John Belushi), “When Harry Met Sally…”(1989, with Billy Crystal, Meg Ryan and Bruno Kirby) and numerous other motion pictures. Aside from numerous guest appearances on television shows throughout her screen career, her most recent television role was playing the mother of Rob Delaney’s character in the series “Catastrophe” (a co-production of Amazon Studios and Britain’s Channel Four Television). According to Seth Kelley and Cynthia Littleton’s article in Variety, Fisher recently filmed several episodes of the show in London. She would overcome her drug and alcohol problems in her screen career, which would be the basis for her successful novel, “Postcards from the Edge,” which was made into a film by Mike Nichols in 1990 (with Meryl Streep in the role of actress Suzanne Vale, based off of Fisher’s real-life accounts). Fisher also wrote the screenplay for the motion picture adaptation of her novel, thus becoming a script doctor and screenwriter for numerous film and television programs. This year, she earned a lifetime achievement award from Harvard University in the field of cultural humanitarianism. Update (12/28): The Associated Press reported this evening that Fisher’s mother, actress Debbie Reynolds died at the age of 84, one day after the death of her daughter. Survivors include Fisher’s brother Todd, her daughter Billie Lourd (who is currently starring in the Fox series “Scream Queens”) and a canine companion, a French bulldog named Gary. A retrospective post on Fisher’s mother, Debbie Reynolds will be on “Silver Screen Reflections” soon. Silver Screen Reflections remembers iconic actress Carrie Fisher (1956-2016). Tribune’s Antenna TV network will honor the life and legacy of Carrie Fisher by showing her 1983 appearance on “The Tonight Show with Johnny Carson” (alongside guest Garry Shandling, who died earlier this year) on Wed., Dec. 28 at 11 p.m. Eastern/10 p.m. Central. The episode will repeat on Antenna TV at 2 a.m. Eastern/1 a.m. Central. In the Frederick, Maryland/Washington, D.C. area, Antenna TV can be found on WDCW-TV 50.2 (over-the-air) and on Comcast 201. 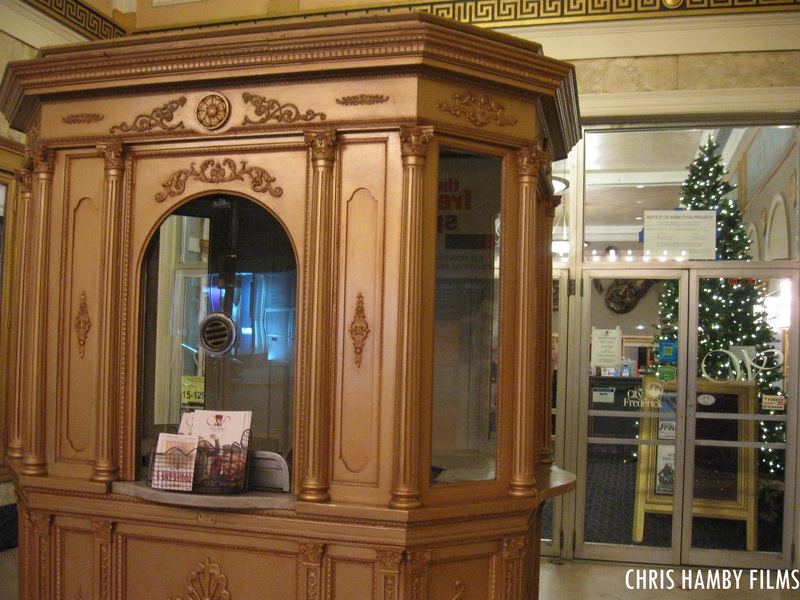 Ticket booth (w/Holiday trimmings from the Tivoli/Weinberg lobby) outside of the Weinberg Center for the Arts during the holiday season (taken in November 2015). Happy Hanukkah, Merry Christmas, Happy Kwanzaa, Happy Winter Solstice, Happy Winter Solstice, Happy (belated) St. Nicholas Day, Happy Bodhi Day and Happy Winter Break! Peaceful greetings to all throughout the season! Watch something interesting during the holidays/holiday break! In honor of Myrna Loy as the “Star of the Month” for December, Turner Classic Movies will be showcasing one of her most memorable films. Beginning this Fri., Dec. 23 at 8 p.m. Eastern/7 p.m. Central, TCM will be showcasing the 1934 film adaptation of the Dashiell Hammett novel, “The Thin Man,” featuring William Powell and Myrna Loy as husband-and-wife sleuths Nick and Nora Charles. As part of the network’s Friday night “Star of the Month” salute to Loy, all six Metro-Goldwyn-Mayer “Thin Man” films will be shown throughout the evening. 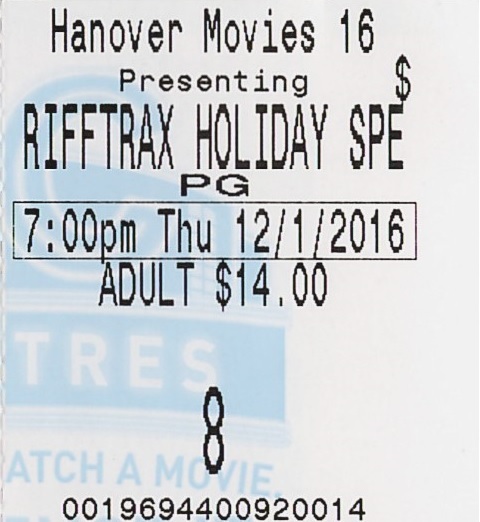 Ticket stub from the “RiffTrax Holiday Special Double Feature” presentation at the R/C Hanover multiplex (Chris Hamby/Chris Hamby Films). Fans of RiffTrax and “Mystery Science Theater 3000” in the Hanover area gathered to watch an encore “double feature” of two popular RiffTrax events. About 10 audience members (including the writer of “Silver Screen Reflections”) attended the RiffTrax Holiday Double Feature, presented by RiffTrax in conjunction with Fathom Events on the evening of Thu., Dec. 1 at the R/C Hanover Movies 16 multiplex (a sister cinema venue to the Gateway Gettysburg cinema, which also showcased the RiffTrax/Fathom screening). The first offering in the RiffTrax Holiday Double Feature was an encore presentation of the RiffTrax crew’s 2013 riff of Nicholas Webster’s 1964 Z-budget film (a “golden turkey” favorite of all MSTies), “Santa Claus Conquers the Martians” (featuring Pia Zadora as the martian Girmar, Bill McCutcheon as Dropo, Ned Wertimer as news reporter Andy Henderson and John Call as Santa Claus). Introduced by a magic pixie character named “Snoopy*” (played by Rochelle Stanton), the Sid Davis short could have been the inspiration for another infamous cheesy educational short subject that was mocked on MST3K (during a showing of “War of the Colossal Beast” on Nov. 30, 1991), “Mr. B. Natural” (produced in 1957 for Conn musical instruments by Kling Productions, featuring Betty Luster in a similar magic pixie role- “Mr. B. Natural” can now be seen on Shout! Factory TV as part of an online collection of MST3K shorts). After the intermission, audiences were treated to an encore of the RiffTrax crew’s 2009 live performance, “RiffTrax Christmas Shorts-Stravaganza,” featuring special guest “Weird Al” Yankovic hilariously mocking a 1939 musical short on New England pork, “Three Magic Words.” The short was directed by Al Christie, a veteran film producer who produced short comedic films, dating back to the silent era. It was produced by another industrial/educational film company, Wilding Picture Productions. Mike, Kevin and Bill also riffed several other unusual shorts (mostly from Castle Films), including “A Christmas Dream,” the hilariously cheesy Clem Williams short “A Visit To Santa Claus.” a rendition of “Parade of Aquatic Champions” (one of the most popular RiffTrax shorts), the 1948 Max Fleischer animated rendition of “Rudolph The Red-Nosed Reindeer” (for Jam Handy) and an Encyclopaedia Britannica short, “A Christmas Rhapsody-” just to name a few. The “RiffTrax Holiday Special Double Feature” was an enjoyable (and hilarious) experience, along with new holiday photo wraparounds (of photos sent in by RiffTrax fans from coast-to-coast) hosted by Mike, Kevin and Bill. Attendees of the special presentation were also treated to the iconic pre-show trivia slides, along with an exclusive offer for a digital holiday package full of RiffTrax goodies! With the fine art of riffing by the RiffTrax crew and special guest “Weird Al” Yankovic (during the 2009 shorts-stravangaza with creepy Z-budget cinematic Santas), the double-feature holiday presentation was an enjoyable experience that was enjoyed by all! The “RiffTrax Holiday Special Double Feature” was the perfect escape (before the stress of final exams/final projects week)! RiffTrax Live: “Santa Claus Conquers The Martians” (2013) and RiffTrax Live: “Christmas Shorts-Stravaganza” (2009), available on digital download and DVD (the RiffTrax Christmas Shorts-Stravaganza is also available on Blu-Ray, direct from RiffTrax)! Questions/Comments about the “RiffTrax Holiday Special Double Feature?” Drop a line at the comments section! 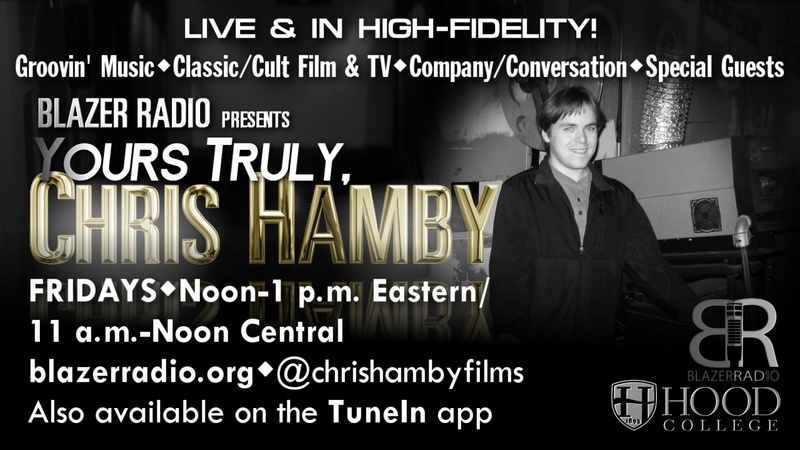 Ad for Blazer Radio’s “Yours Truly, Chris Hamby” (Sept. 2016). Greetings, Everyone (fellow friends of the matinee and pilots of the college radio airwaves)! As I am taking a brief break from final assignments for my last set of courses at Hood College, this Friday will mark the season finale of “Yours Truly, Chris Hamby” on Hood College’s exclusive online radio station, Blazer Radio. The fun starts this Fri., Dec. 9 at Noon Eastern/11 a.m. Central/9 a.m. Pacific on blazerradio.org and on the TuneIn app! The season finale of Blazer Radio’s “Yours Truly, Chris Hamby” will have shout-outs to fellow friends of the matinee/pilots of the airwaves and some interesting tunes (including several that have been played before on previous episodes of this program), a couple of holiday/seasonal tunes and more! No, this will not mark the end of “Yours Truly, Chris Hamby.” Since I got the chance to do my own radio program on Blazer Radio back in mid-September, I love doing this show every week- sharing good, groovy tunes with all listeners from coast-to-coast and around the globe (along with fun facts on classic/cult film and television programs)! Though I will be graduating from Hood College at the end of this semester (along with several fellow friends of the matinee/ “pilots of the airwaves” from Blazer Radio)*, I am hoping to continue “Yours Truly, Chris Hamby” in one form or another- on Blazer Radio or on another online platform. Stay tuned to this blog for more details! Thanks to all for listening to this season of “Yours Truly, Chris Hamby” on Blazer Radio! Hopefully, this show will make a comeback next year- more developments will follow! And if anyone has a special song request, or if you would like to have an instant on-air shout-out during tomorrow’s show, feel free to let me know! Fri., Dec. 9 at Noon Eastern/11 a.m. Central/9 a.m. Pacific on Blazer Radio (blazerradio.org) and on the TuneIn app! Fellow Hood students: Meet Chris Hamby at the on-campus Pop-Up art/photography exhibition at Hood’s Tatem Art Gallery (Thu., Nov. 8 from 5:30 p.m.-7:30 p.m.)! And to all fellow friends of the matinee/pilots of the airwaves- we’re all in this together. *Congrats to all fellow Hood students (including several friends of the matinee/“pilots of the airwaves” from Hood College and Blazer Radio) who will be graduating at the end of this semester!